René Redzepi (born 16 December 1977) is a Danish chef and co-owner of the two-Michelin star restaurant Noma in the Christianshavn neighborhood of Copenhagen, Denmark. His restaurant was voted the best restaurant in the world by Restaurant magazine's World's Best Restaurants in 2010, 2011, 2012 and 2014. Redzepi is noted for his work on the reinvention and refinement of a new Nordic cuisine and food that is characterized by inventiveness and clean flavours. Redzepi was born in Copenhagen, Denmark, to an immigrant father from the Yugoslav republic of Macedonia who worked various jobs ranging from taxi driver to produce and fish seller, and a Danish mother who worked as a cleaner. His father is of Albanian ethnic descent. When he was young, Redzepi's family moved to Macedonia and lived in Tetovo, a predominantly ethnic Albanian area in northwestern Macedonia, until 1992 and the start of Yugoslav wars. Redzepi has said he found life in Macedonia very enjoyable compared to his later time in a small apartment in a not great neighborhood in Denmark. In Macedonia, Redzepi lived in a rural area in a large multi-generation house where they ate locally sourced food, mostly vegetarian, and very healthy. After the family moved back to Denmark, Redzepi spent often his summers in Yugoslavia when he was young. Redzepi has a twin brother, Kenneth Redzepi. He and his brother had multiple newspaper delivery services and worked for a local store so that they could contribute to the family's income, as money was very tight for his family. When he was 15 years old, Redzepi left high school. He went to restaurant school with a friend. After choosing a culinary career, Redzepi trained at a local family-owned Michelin starred restaurant called Pierre André in Copenhagen, where he had an apprenticeship that lasted 4 years. When he was 19 years old, he went to work at Le Jardin des Sens in Montpellier in Southern France. 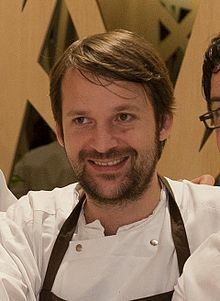 Redzepi first visited El Bulli as a guest in 1998 and subsequently worked there during the 1999 season. Back in Copenhagen, Redzepi started working at Kong Hans Kælder, which had been one of the city's leading gourmet restaurants since the mid-1970s. In 2001 he spent four months working under Thomas Keller at The French Laundry in California, but returned to Kong Hans Kælder and Copenhagen. In December 2002, when he was 24 years old, Redzepi was contacted by Claus Meyer, who had been offered to operate a restaurant at the North Atlantic House, a former 18th century warehouse which was being turned into a cultural centre for the North Atlantic region. The restaurant, Noma, was opened in 2004 with Redzepi as the head chef. The name is a combination of the Danish words nordisk, which means Nordic, and mad, which means food. Redzepi sources much of his food locally and does research by foraging for food in the wild. He said that this comes from his time living in Macedonia, where food was local and fresh. Much of the approach to the menu and food at Noma is based on seasonal themes of what is available at the time. Redzepi also focuses on fermentation and dehydration, experimenting with using as much of the plants, meat, and fish as possible. Redzepi is married to chef Nadine Levy Redzepi, who grew up in Portugal and Denmark. They have three daughters. Redzepi, René; Meyer, Claus; Isager, Ditte (foto) (2007). Henrik Kerrn-Jespersen (ed.). Noma: Nordisk Mad (in Danish). Denmark: Politiken. ISBN 978-8-756-77539-7. OCLC 475466661. Redzepi, René; Meyer, Claus; Marmorstein, Dan A. (translated by); Isager, Ditte (photographs by) (2006). Kerrn-Jespersen, Henrik; Seedorff, Christine (eds.). Noma: Nordic Cuisine. Denmark: Politikens Forlag. ISBN 978-8-756-78333-0. OCLC 859381695. Redzepi, René; Isager, Ditte (photographs by); Eliasson, Olafur; Skyum-Nielsen, Rune (2010). Noma: Time and Place in Nordic Cuisine. London: Phaidon. ISBN 978-0-714-85903-3. OCLC 655678787. Redzepi, René; Ulrich, Lars (2013). René Redzepi: A Work in Progress. Journal, Recipes and Snapshots. London: Phaidon Press. ISBN 978-0-714-86691-8. OCLC 858006266. Redzepi, René; Staszak, Kamilla (2012). "Mój sposób na żurek". Polityka (in Polish). Warszawa: Wydawnictwo Prasowe: 90–91. ISSN 0032-3500. OCLC 1007973573. Andelman, David A.; Fredrick, Yaffa; Redzepi, René (2015). "The Passion of Food". World Policy Journal. Durham: Duke University Press. 32 (3): 19–24. doi:10.1177/0740277515605285. ISSN 0740-2775. OCLC 5878738067. Redzepi, René; Vorting, Christian (director) (2008). Noma: A Boiling Point / Noma pa Kogepunktet (film). Copenhagen: Danish Broadcasting Corporation. OCLC 942337686. Deschamps, Pierre (director); Deschamps, Etta Thompson (producer); Redzepi, René; Meyer, Claus; Adrià, Ferran (2015). Noma: My Perfect Storm (documentary)|format= requires |url= (help). Los Angeles, California: Magnolia Home Entertainment. OCLC 940513265. ^ Gershenson, Gabriella (19 December 2013). "A Nordic Noel With Chef René Redzepi". The Wall Street Journal. ^ Reichl, Ruth; Redzepi, René; Chang, David (6 October 2010). Tasting Culture with René Redzepi, Ruth Reichl & David Chang (video interview). New York, NY: LIVE from the NYPL. ^ a b Frewin, Angela (27 April 2010). "René Redzepi of Michelin-starred restaurant Noma". The Caterer. ^ a b c d e Durrant, Sabine (6 November 2010). "René Redzepi: the outsider". The Guardian. ^ Bittman, Mark (3 November 2011). "Rene Redzepi, the Prince of Denmark". The New York Times. ^ Moran, Terry (18 June 2010). "René Redzepi: In His Own Words" (Transcript and video). Nightline. ABC News. ^ "René Redzepi and the story of Noma" (Video). Phaidon Press. 2010. ^ Lajh, Andreja (10 November 2015). "Chapter 1: Rene Redzepi on his origins". Haut De Gamme. ^ a b c Frank, Søren (26 April 2010). "Mød verdens bedste kok = Meet the world's best cook". AOK (in Danish). ^ "Famous Spanish restaurant El Bulli shuts, for now". The Denver Post. The Associated Press. 30 July 2011. ^ Govan, Fiona (30 July 2011). "Top chefs fly in from around the world to pay tribute to El Bulli restaurant for one last time". The Daily Telegraph. ^ Kramer, Jane (14 November 2011). "The Food at Our Feet". The New Yorker. ^ Gajanan, Mahita (28 June 2017). "Chef René Redzepi Wants You to Forage for Your Own Food". Time. ^ Lajh, Andreja (16 November 2015). "Chapter 2: Rene Redzepi on sustainability". Haut De Gamme. ^ Jenkins, Allan; Redzepi, Nadine Levy (recipes by) (17 September 2017). "Nadine Levy Redzepi: What do you cook for the world's best chef?". The Guardian. ^ "Cateys 2016 winners revealed". The Caterer. 6 July 2016. ^ Redzepi, René; Vorting, Christian (director) (2008). Noma: A Boiling Point / Noma pa Kogepunktet (film). Copenhagen: Danish Broadcasting Corporation. OCLC 942337686. ^ Deschamps, Pierre (director); Deschamps, Etta Thompson (producer); Redzepi, René; Meyer, Claus; Adrià, Ferran (2015). Noma: My Perfect Storm (documentary)|format= requires |url= (help). Los Angeles, California: Magnolia Home Entertainment. OCLC 940513265. Reichl, Ruth; Redzepi, René; Chang, David (6 October 2010). Tasting Culture with René Redzepi, Ruth Reichl & David Chang (video interview). New York, NY: LIVE from the NYPL. Holdengräber, Paul; Redzepi, René (5 May 2013). René Redzepi and Paul Holdengräber on Kierkegaard in The Black Diamond - The Royal Library (video interview). Det Kgl. Bibliotek. Wikimedia Commons has media related to René Redzepi.